This Fruit Dip is so easy to prepare and you will have an amazing dessert in just a few minutes. It’s light, silky, and full of amazing chocolate flavor. Within 5 minutes, you will have a heavenly dip that tasted just like chocolate cake. There are many different fruit and crackers you can serve with this dip but you will truly just want to grab a spoon and eat it straight from the bowl. If you want to include another dip on the fruit tray, try my Skinny Caramel Fruit Dip or Turtle Chocolate Fruit Dip. Hot Chocolate Cheesecake Dip is especially wonderful because it’s served warm and the creamy chocolate texture is unbeatable. 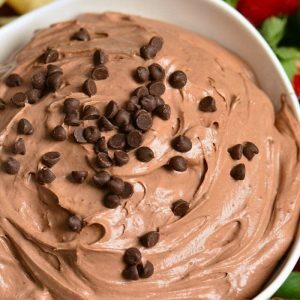 This chocolate cake fruit dip is pure heaven, it’s so smooth and silky that every bite is a delight. 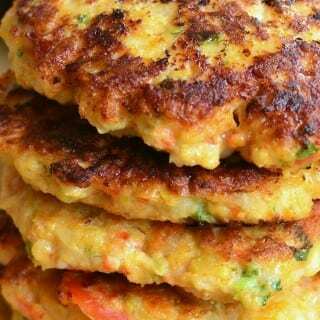 If you’re deciding what to serve at your next party or bring to a potluck, this is it. Look no further because this is a perfect dip for any occasion. It might be a Super Bowl party, a baby shower, or a casual family gathering and this dip will be the talk of the party. There are only a few simple ingredients that go into this dip. It’s made with cream cheese, COOL whip topping, chocolate cake mix, hot fudge topping, and heavy whipping cream. 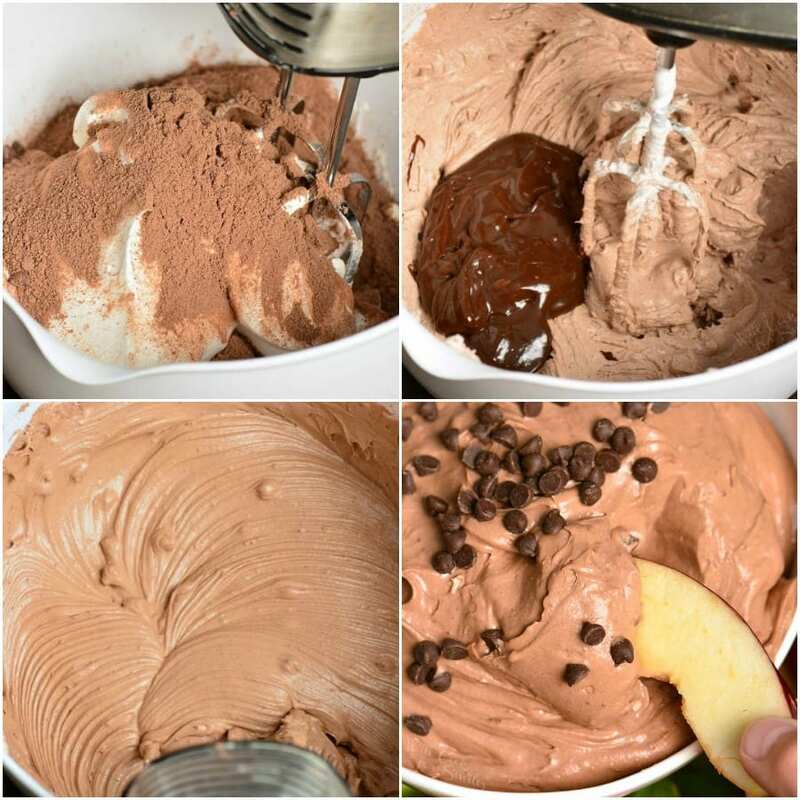 To add a little crunch to the dip, you can mix in some mini chocolate chips. Fruit dip only takes a few minutes to whip up but it can easily be made ahead of time of stored in the refrigerator until needed. 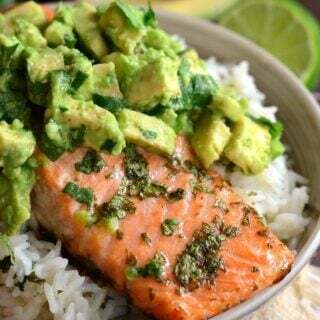 Just make sure to store it in an air-tight container to wrap the bowl with saran wrap before refrigerating. 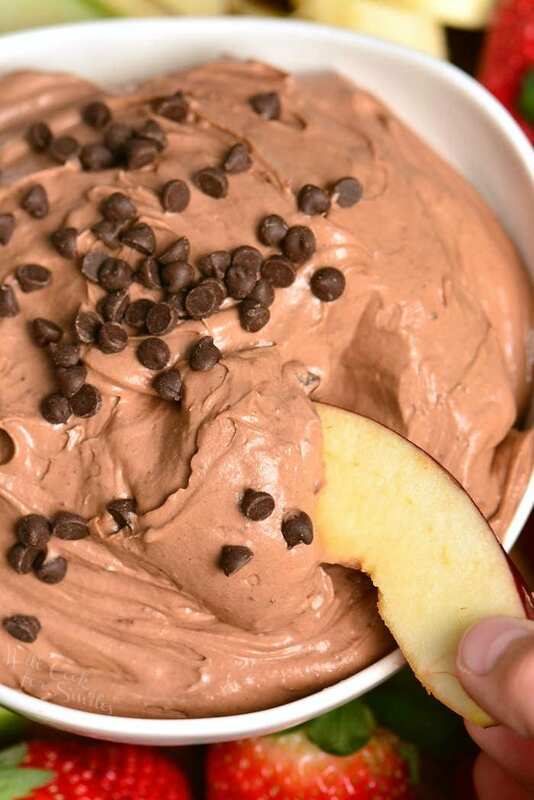 The best fruit for this chocolate cake fruit dip is apples and strawberries. Both apple slices and strawberries are solid and big enough to be dipped without breaking. 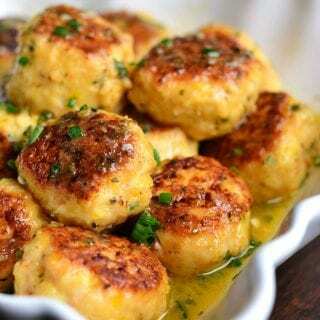 Bananas is another good fruit that will complement the flavors of the dip. Although, bananas can be soft do make sure to cut them into larger pieces. Try unsalted or lightly salted plain crackers. Graham crackers and sugar cookies are always good with any flavor fruit dip. WHAT TO DO WITH LEFTOVER CHOCOLATE CAKE MIX? I definitely anticipate this question to be one of the first ones asked. This dip requires only 1 cup of cake mix so there will be a little more than half leftover. Save remaining cake mix by closing the bag it came in air-tight and placing it in another zip-lock bag. This will help keep any moisture out of the cake mix. Leftover cake mix can be used in milkshakes, cookies, or other fruit dips. 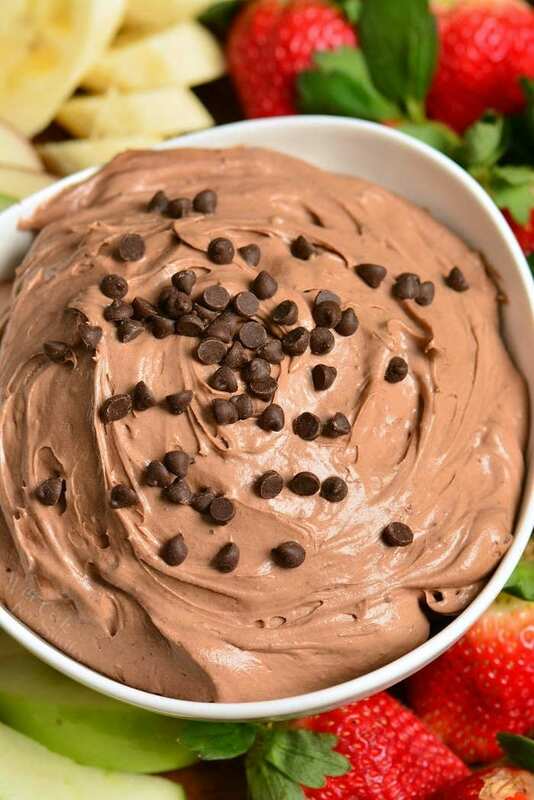 This chocolate cake fruit dip recipe can easily be double. 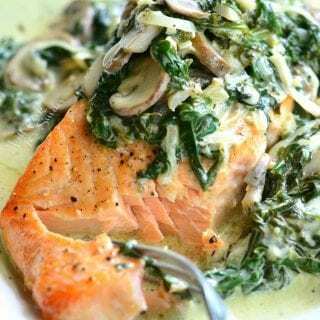 If you will make extra dip, you may not need to worry about it because you will use up almost all of the mix. This is another question that I get quite a bit. COOL Whip is not as easily available in other countries as it is in the US so sometimes it has to be substituted. First, it’s important to remember that a whipped topping like COOL Whip is not just whipped cream. It’s a denser, thicker, and more stabilized than whipped cream. Therefore, substituting whipped topping for whipped cream may not work in every recipe. In many recipes, much like this one, whipped cream will be too thin to substitute equally. Whipped cream would need to be stabilized to be thicker. Luckily, this is a cake batter fruit dip so you can easily stabilize homemade whipped cream with extra chocolate cake mix. 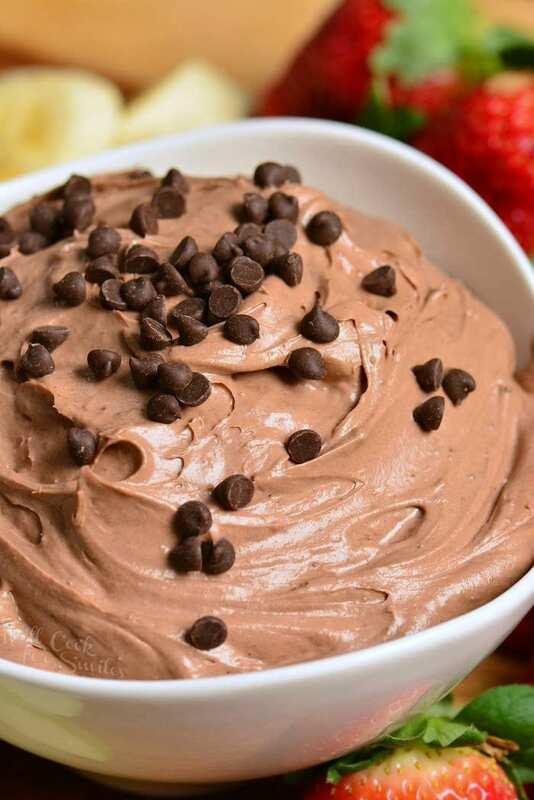 Use 1 1/2 cups of heavy whipping cream, 2 tablespoons of white granulated sugar, and 2-3 tablespoons of chocolate cake mix to make whipped topping for this fruit dip. Another way to go is to add cornstarch when making the whipped cream. 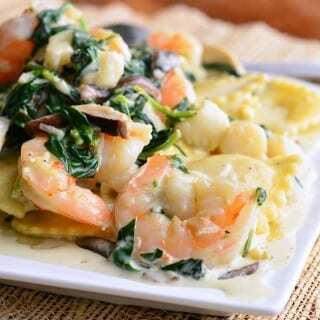 Add 1 tablespoon of cornstarch for every cup of heavy whipping cream. NOTE: if you will be substituting stabilized homemade whipped cream in this dip, the process will be different. Beat cream cheese and whipped cream separately. Once cream cheese is smooth and soft after beating it for a couple of minutes, add hot fudge topping and beat until mixed. Beat in the 1/4 cup of heavy whipping cream and cake mix into the cream cheese mixture. FOLD in stabilized whipped cream last. 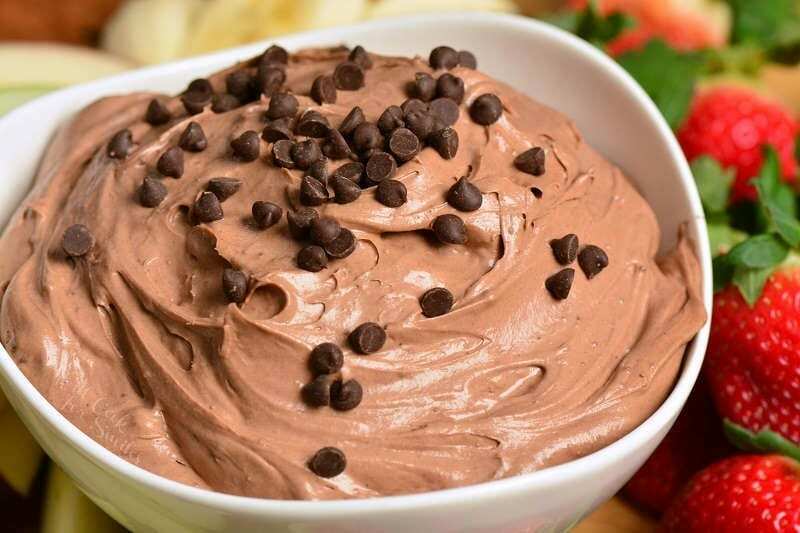 Smooth and silky fruit dip that tastes just like chocolate cake. To soften cream cheese, simply let it sit on the counter in the original foil package for 30 minutes before using it. Add hot fudge topping and heavy whipping cream and beat for another minute or so until all smooth. Fold in mini chocolate chips if using. 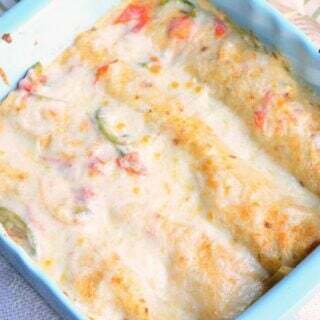 Serve right away or refrigerate in an air-tight container.